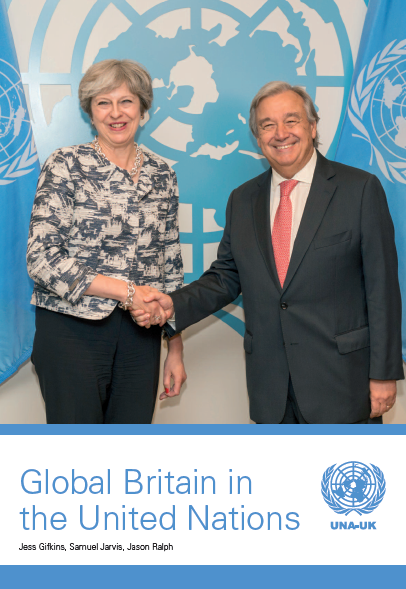 Read UNA-UK‘s latest report “Global Britain in the United Nations“, the outcome of a research project by academics from the Universities of Manchester, Leeds and Southampton on behalf of the United Nations Association. The report includes recommendations for the UK to demonstrate its added value to the United Nations and adopt a principled and values-driven foreign policy in order to maintain its current influence after it leaves the EU. Read the Afghan Women’s Network’s public statement on the Doha Peace Talks including a call for firm and explicit guarantees that Afghan women’s gains are protected in any peace process. This builds on their previous statement calling for fair and lasting peace, which requires the full, equal and meaningful participation of women. Read this report from the UN Special Rapporteur on the situation of women human rights defenders. Women human rights defenders often face additional and different risks and obstacles that are gendered, intersectional and shaped by entrenched gender stereotypes and deeply held ideas and norms about who women are and how women should be. 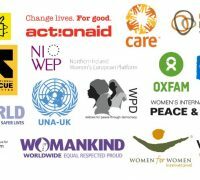 The report contains recommendations and examples of good practices to support the building of diverse, inclusive and strong movements of women human rights defenders, and recommendations addressed to all stakeholders to ensure that women defenders are supported and strengthened to promote and protect human rights. 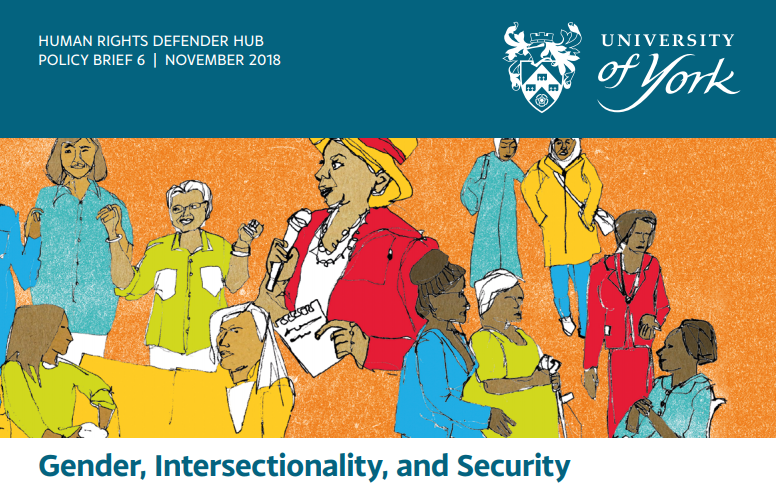 The Human Rights Defender Hub at the University of York has published a policy brief titled “Gender, Intersectionality, and Security” that examines how gender and intersectionality affect women human rights defenders’ risks, the issues they face, and their experiences of security and protection. A list of all the parallel events is available in the NGO CSW63 Forum Handbook. 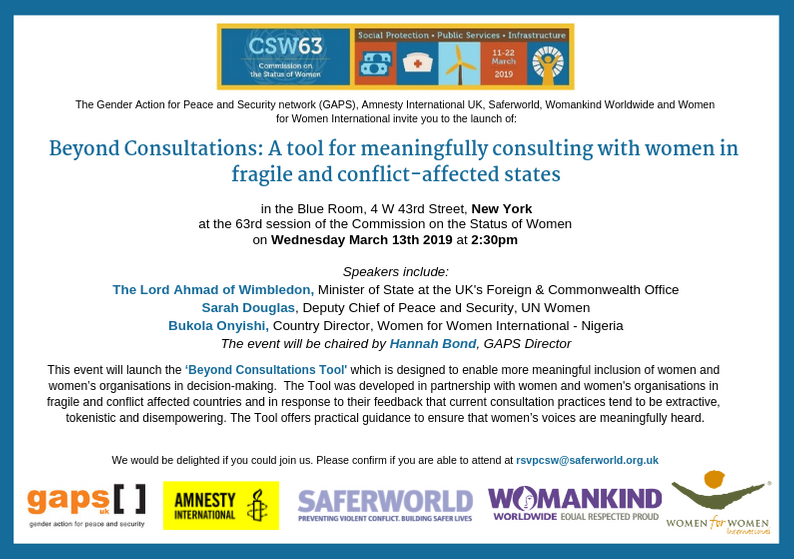 GAPS – along with GAPS members Women for Women International UK, Womankind Worldwide, Saferworld and Amnesty International UK – will host the event “Beyond Consultations: A tool for meaningfully consulting with women in fragile and conflict-affected states” on Wednesday 13 March, 14:30-16:00 in the Blue Room, 4 W 43rd Street, New York. GAGE, ODI, DFID and UNICEF are hosting the event “Gender- and adolescent-responsive social protection: unleashing the potential of social protection for adolescent girls and women” on Tuesday 12 March, 10:00-11:15 in Conference Room 1, UN Headquarters. Women In International Security has opened applications for the 2019 Next Generation Gender, Peace and Security Symposium. The Symposium will convene an international cohort of 20-24 graduate students and young professionals for a 5-day programme in November 2019, examining international security challenges from a gender perspective.